Fears - body, last, What Is Fear? Fear is a normal emotion, experienced when a person senses danger. Fear includes physical mental and behavioral (bee-HA Y-vyor-al) reactions. Certain childhood fears are common and normal. Fear is the emotion that people feel when they sense that they are in danger. It is a protective emotion, which signals danger and helps a person to prepare for and cope with it. Fear includes physical, mental, and behavioral reactions. The physical reaction to fear is called the "fight or flight" response. "Fight or flight" is an involuntary response, a response that a person cannot control consciously but that is controlled by the body's nervous system * . It is the body's way of preparing to run from danger or to fight. The heart beats faster, and the blood pressure and breathing rate increase. Oxygen-rich blood rushes to the large muscles of the body, which are tensing to prepare to fight. The pupils of the eyes grow larger to help the eyes scan for danger. Epinephrine * , also called adrenaline (a-DREN-al-in), is released to prepare the body for quick action. Sweat is produced to cool the body. Mentally, fear triggers thoughts about the danger or threat that the person senses. Thoughts may mentally size up the danger, anticipate what might happen, or imagine ways to avoid harm. Behaviorally, the person may startle or jump and then run, freeze, or get ready to fight. Fear and anxiety (ang-ZY-e-tee) are similar emotions but with an important difference. Fear is the emotion that people feel when a danger is actually present, while anxiety is the fear connected with worrying about danger that might happen. A phobia (FO-bee-a) is an intense fear of specific things, like dogs or spiders or riding in elevators. With a phobia, the fear a person feels is out of proportion to the real danger. The person with a phobia is very worried about the possibility of seeing the feared object or experiencing the feared situation. People with phobias may go to great lengths to avoid any situation that might bring them face to face with the object of their fear. Because of all the worry and avoidance, a phobia can interfere with a person's everyday life. Certain fears are very common and normal during childhood. In fact, all children have fears at times during their lives. Because so much of the world is new to children, they may fear certain things until they understand them better or are better able to cope. Fear serves a protective purpose, keeping children appropriately cautious while they learn about what is safe and what is dangerous. Fears of animals, loud noises, or being in water are common in very young children, who are still learning to understand the information their senses are gathering. Babies as young as 8 months old may fear strangers, and this is a sign that the baby is able to recognize his parents and to tell them apart from strangers. * nervous system is a network of specialized tissues made of nerve cells, or neurons, that processes messages to and from different parts of the human body. * epinephrine (e-pe-NE-frin) is a hormone, a chemical that has regulatory effects on different parts of the body. It is produced by the adrenals (a-DREE-nals), a pair of glands found at the top of the kidneys. This is a cross-section of a brain showing the amygdala and caudate nucleus—the structures believed to be linked to negative emotions like fear and anger. 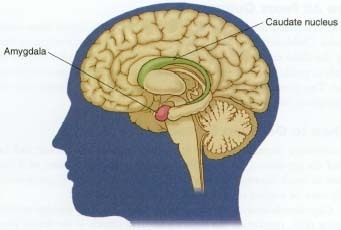 The amygdala is believed to be fully developed by the time a baby is born. The prefrontal cortex (the front of the brain) where thinking and planning take place, takes longer to mature. This may explain why it takes time for children to learn how to control their fears. as soon as they are able to understand the difference between real and pretend. Older children are more likely to fear real-life things. Examples might be fear of burglars, fear of getting hurt or lost, or fear of natural disasters like earthquakes or extreme weather like hurricanes. These children may need reassurance and support from parents while they learn to cope with worry and fear and gain confidence in dealing with life's challenges. Fearful parents tend to have fearful children. Without realizing it, parents may teach children to be too fearful or cautious of certain things, not so much by what they say but by how they act. If someone's mother always crosses the street to avoid dogs and gets a little pale when a dog is nearby, chances are the child will learn to be afraid of dogs. Research has found that fears or worries can run in families. It may be that certain fear reactions are inherited, but we do not have to live with them just because they may be inherited. early-school-age children (6-10 years old): fear of burglars, divorce, tornadoes, hurricanes, injury, being bullied, losing a parent. Fears also can be "unlearned." If the fearful child watches another child calmly approach and pet a dog, she is learning that petting a dog can be safe and pleasant. By watching and then learning to go toward the dog slowly herself, with the right adult support, she can learn to overcome her fear of dogs. When leaving the home, perhaps even to go to school, is too scary or when important activities are avoided because of fearfulness, professional help may be needed to help "unlearn" fears. Most childhood fears pass with time, learning, and support from caring adults. Childhood fears do not get better by teasing, threatening, or forcing the child to meet the feared object or situation. Such remedies are likely to produce shame and lower self-esteem, and they may even worsen fear. The protective emotion of fear is not outgrown. People feel fear throughout life whenever they sense danger. Sometimes a normal childhood fear can become intense or last well beyond the age when a child usually outgrows it. If this happens, or if fears cause so much distress that they interfere with everyday life, professional help may be needed to help children get over their fears. Cognitive-behavioral therapy is often helpful. It may involve teaching coping skills, supporting the child's gradual approach to the feared situation, and coaching parents to provide needed reinforcement and support. The feelings and sensations people get when they are afraid or anxious are similar to the excited thrill people feel when they go on a scary ride at an amusement park or see a scary movie. Some people actually like the feeling, while others do not. Research psychologists (sy-KOL-o-jists) have described anxiety as a complex emotion that is made up of fear plus one or more other emotions, such as distress, anger, excitement, shyness, or guilt. Anxiety that is made up of fear plus excitement will be experienced differently from anxiety that is made up of fear plus distress, for example. Anxiety Disorders Association of America, 11900 Parklawn Drive, Suite 100, Rockville, MD 20852. Nemours Center for Children's Health Media, Alfred I. duPont Hospital for Children, 1600 Rockland Road, Wilmington, DE 19803. This organization's KidsHealth website has artides about fear.